After the first attempts of the ABAP CodeRetreat (ACR) in 2016, the format got more momentum in the year 2017. We facilitated 8 free community CodeRetreats and 3 internal company CodeRetreats. Especially the free community CR´s are important to us. We believe in concepts such as state-of-the-art development. And that does not fall into your lap. Topics like clean-code, clean-architecture, robust and extensible software are still modern and important. And a perfect way to getting with this in contact is our event format! Personally, I’m very happy and grateful that Christian supports the idea and uses his spare time for the community and the events. In January, it started with the ACR in the Netherlands. It was our first assignment outside of Germany and we saw the Dutch community as active and in many issues as a ‘first movers’. Frank Hammen and his colleagues organized the event in de Meern and made it possible. In March it was almost a home game for me. In Passau, Christian Lechner invited to the event, and we found an international audience. Martin Fischer and his company had chosen April 1st as the event day. In the modern IT rooms, no wish remained open. Martin Fischer as organizer did not only shine as an organizer, above all he showed great personal commitment to make the event in Stuttgart possible. Finally, it was time, and we had the opportunity to perform the ACR on May in one of my favorite cities. This is the beautiful city of Vienna and this was made possible by Johann Fößleitner. All participants were highly motivated and this energy has also inspired us, facilitators. I like to visit the mountains in summer, so we owe it to Markus Reich that we were able to organize the event on July in beautiful St. Johann in Tirol! Hendrik Neumann was enthusiastic about the event idea from the beginning, and again it was a great Event in September. Next year maybe with a blog post again?! 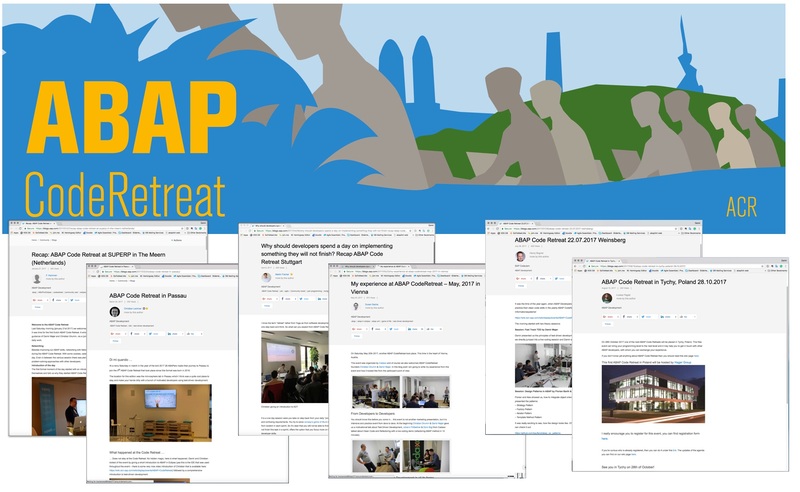 How do you organize an ABAP CodeRetreat? We believe in that concept of learning by doing and exploring. And by the way, it is a lot of fun for you. And so far the feedback from all participants has been outstanding! Don´t hesitate and get in contact with us for the free community events or for internal events.